Mormon Wookiee: #78: The Most Amazing Family I Have Ever Met. #78: The Most Amazing Family I Have Ever Met. Thank you for all of the nice e-mails, Facebook messages, and prayers related to our post about infertility last week. This world is full of so many wonderful people! We love you guys. On a similar note, I would like to take a few minutes to talk to you about the most amazing family I have ever met. A couple of Mondays ago, Diane and I were feeling lazy/hungry after work and decided to go out to dinner. We debated between Cafe Rio, Chick-Fil-A, and Jamba Juice....but eventually settled on Rumbi's Grill (makes sense, right?). As we walked into Rumbi's, the first thing we heard was the familiar tune of "Happy Birthday". It made us smile to know that another family must be out for Family Home Evening, celebrating a birthday together. Once we ordered our food and sat down, we looked over at the family celebrating the birthday. We noticed a mom, a dad, three clearly identifiable children of the parents, and five other kids of Asian heritage. At first, we thought, "Hmmm. I bet the family must volunteer at a group home and decided to take these other children out to dinner." But as we continued to watch them, we heard one of the Asian children say, "Dada! Dada!". 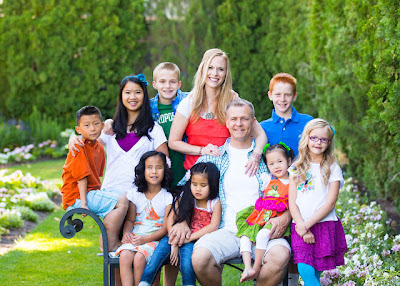 We were amazed to discover that this family had adopted all five of these beautiful children. And then we noticed something even more amazing--each of the adopted children appeared to have some form of disability. One was noticeably blind, another appeared to be autistic, and the adorable youngest daughter had no arms. When the mother of the family walked over by us to fill up some drinks, we simply could not resist asking her about her family. Although she seemed a little embarrassed to talk about herself, the mother took the time to tell us a little bit about her family. With her permission, I would like to share some of their story. I also absolutely urge you to check out the family's full story on their inspiring blog, A Road Less Traveled. Jeremy and Christianne Green have three wonderful children of their own, Taylor, Parker, and Jessica. However, in 2004 and 2005, the Green's next two children, Jacob and Emily, were both born stillborn. Jeremy and Christianne were heartbroken at the loss of their two beautiful babies, but continued to stay faithful and united as a family. "February 26 was a day that I will never forget. After months of waiting and praying for this sweet little girl, I finally got to live the moment I had dreamed about. We walked into a room at the Civil Affairs Office and there she was, in her foster mother’s arms—our newest angel and most perfect little girl—Elizabeth Mei Green. The night before we had been given an update on her. It had said that she didn’t talk, only walked in circles, and was very somber. However, as they placed her in my arms, this little girl who we had prayed for so earnestly seemed to know that she was home. She threw back her head and began to laugh. This continued for the entire time we were there. We were crying, her foster mother was crying—it was one of the most joyous moments of our lives." Diane and I have been so inspired by the Green family. As we spoke with Christianne, we could just tell that she radiated the light of Christ. Is her life easy? No. Does she ever get tired, frustrated, or stressed? You bet. Would anyone consider her and Jeremy to be bad people if they had decided not to adopt? Of course not. But the fact that they have chosen this "road less traveled" is an incredible example to us. God bless this wonderful family! Parker, Jessica, Sophi, Jeremy, Elli, and Lexi. UPDATE: As I was reading the Green's blog this evening, I was humbled by a recent post. As their family has continued to grow, the Green's are running out of room in their current home. Also, their current home is not wheelchair accessible, which would make things very difficult for new family member, Cali. The Greens would never ask anyone for financial assistance, but a friend in their ward has started a fundraiser to help them build a new home. If you feel impressed to do so, please follow the link to "Puzzle Them Home" and make a donation. I have never met a family who deserves it more. #77: The Challenge of Infertility. #76: Inspirational Story from Stake Conference. #75: Back to Seminary ("Call Me Maybe" Spoof).